Today is July 1st. This is our 06/30/2018 Blog Post. This post was prepared using Blogging With Notes and was published on Sunday, July 01 2018 at 3:30 pm. As Boid’s cage was being changed, the view out Scampy’s rear window caught my attention. View from Scampy's rear window. Today is June 29th. This is our 06/29/2018 Blog Post. This post was prepared using Blogging With Notes and was published on Saturday, June 29, 2018, at 12:45 pm. This morning, the Scampy Team is going east. We are bound for the State of Montana! 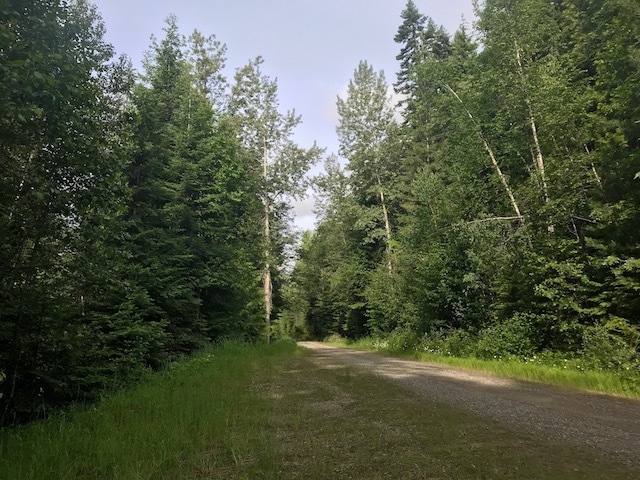 Since you are in the area I recommend, when you are finished in Sandpoint, going on up Nwy 95 through Bonners Ferry and turning east on Hwy 2. Montana is just a few miles to the east. 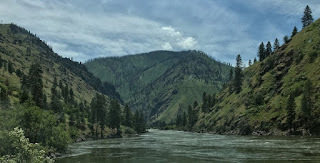 Go into Montana and a few more miles to the east is the Yaak river road. Follow it up into some of the most beautiful country you'll ever see. We are following Dan's comment/suggestion! Thanks, Dan! It appears that T-Mobile is going to continue being weak in Idaho. When I write weak, I mean really, really slow. This morning I ordered one item on Amazon, and it took more than 30 minutes with me mostly waiting for downloads! When the Scampy Team heads east to Montana and Wyoming, T-Mobile coverage may continue the same. We plan using WiFi instead of T-Mobile. Right now we at the Holiday Inn at Ponderay. The WiFi is strong here. Omelet with sausage and cheese. Swiss Miss dark hot chocolate. 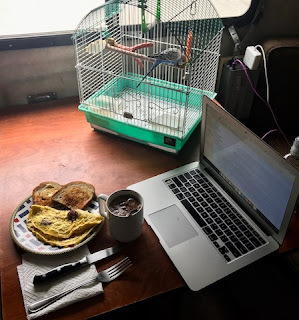 Yesterday I received an email from Chris and Jim Guld known in the RV world as Geeks On Tour. We first met Chris and Jim in July 2004 [Link]. Gillette Wyoming. They asked me to work their booth at the rally. I errored when installing a 35 amp-hour house battery on Scampy's tongue and a 95 amp-hour house battery located inside Señor Tránsito. The idea for this installation is to have power for Scampy when disconnected from Tránsito. This 2-battery configuration works. However, there is a 1-battery configuration that is simpler. That is to have one battery inside Scampy's forward compartment. 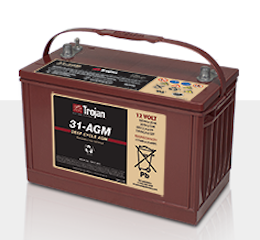 Note: The plan is to install this Trojan battery upon returning to San Diego for our winter camp. 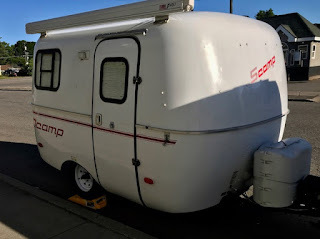 This morning, Scampy goes to the Park RV shop in to have her door repaired. You may recall that I forgot to close Scampy's door before leaving a gas station. 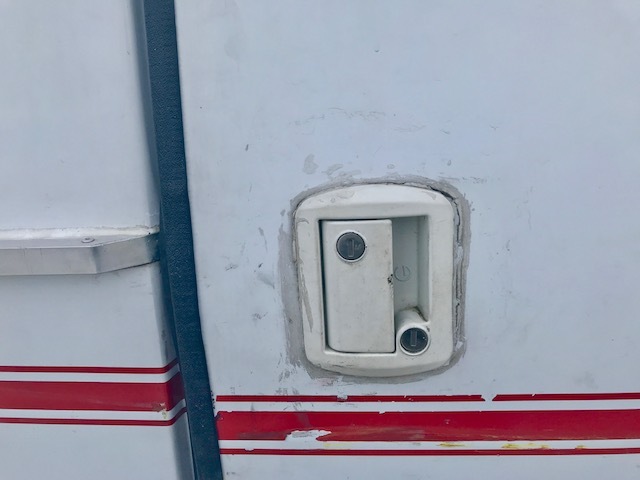 Upon exiting that gas station, the door bottomed out on the curb, ripping off the lower lock! Also, some time ago I changed out Scampy's door latch. I made an ugly job of it. I'm asking the fiberglass guy to clean that mess up. Door latch mess to be cleaned up. Our Nite Camp has a terrible T-Mobile connection. We hate that because it takes sooooo long to do everything while online when data speed is slow. So, we are getting dressed and heading out from our Nite Camp and bound for Starbucks! After leaving my Nite Camp [Sorry! I forgot to put a Nite Camp Location link], I went to Natural Fitness in Sandpoint Idaho. Thank you to the Reader(s) who told me about the Active and Fit program that allows me entrance to fitness clubs all over the country. After publishing this Blog post, I'll workout at Natural Fitness. BTW, muscles take a long time to blossom in old guys like me. However, my muscles are coming along. Slowly! A few Readers have commented that I should go for medical care for my head wound to ensure that there is no infection. I am going to Bonner General Health this morning. Click [Here] to read about my accident. Señor Tránsito is in the Six Star Automotive shop this morning in order to have his leaky front left axle replaced. 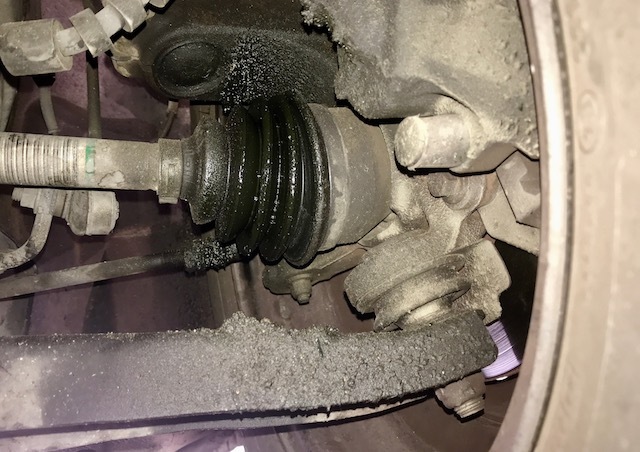 We could have just replaced the axle's boot to save a little $money$. But we chose the entire axle with the boot. Señor Tránsito in the shop. We have an appointment for tomorrow morning to replace Tránsito's leaking left front axle. We Blogged a pic of that axle in yesterday's 8:20 am Blog post. We are re-Blogging that pic below. 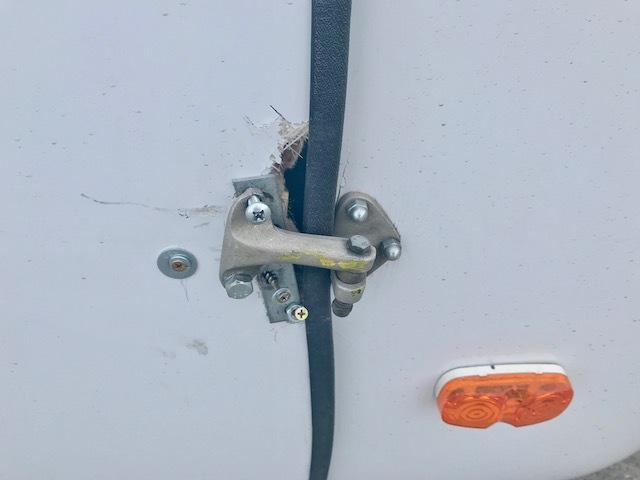 The estimate to do this work at the local Ford dealer was about $400. At Six Star Automotive in Sandpoint Idaho, the cost is $200! Six Star has great reviews! In yesterday's Blog, we listed the pros and cons of keeping The Scampy Team. At first, we included several pro items incorrectly in the con list. Then Reader Tom Pawka commented about that error. We then edited the con list and moved the incorrectly placed con items to the to the pro list. Wow! Our Scampy decision was now sooooo clear! The Scampy Team enjoying life! ➜ The huge amount of storage. For example, a Lance camper and pickup truck have a tiny fraction of storage space compared to Scampy and Tránsito. ➜ I already own Scampy and Tránsito. ➜ If I stay on paved roads, Tránsito tows Scampy fine. 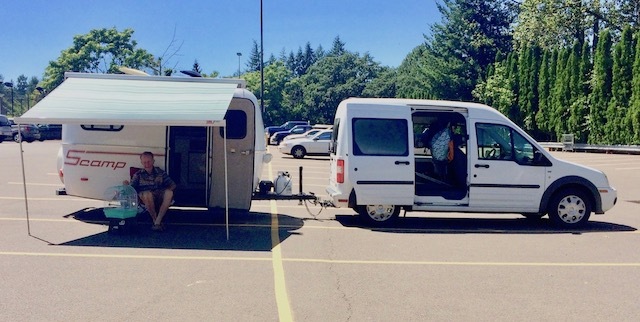 ➜ Tránsito gets 18 miles per gallon while towing Scampy. ➜ The cost of buying a new rig would be substantial. ➜ Scampy and Tránsito would have to be sold. Not an easy thing to do. ➜ We will not be traveling during the transition from Scampy and Tránsito to the new rig. ➜ We will no longer have the storage space of Scampy and Tránsito if the new rig is pickup truck and camper. ➜ If the new rig consists of a pickup truck towing Scampy, turning around to proceed in the opposite direction while on a narrow forest road will be very difficult. There are many reasons that I keep Scampy and Tránsito. 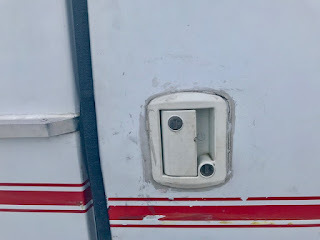 These reasons influence me to be very cautious about a possible replacement RV setup. We will be hanging around Ponderay Idaho for a while. We were looking at a Google Map using satellite imagery. There are some interesting waterways here. The Pend Oreille River, Crocollala Lake, Lake Pend Oreille. We want to spend some time perhaps camping at these places. Also, a lot of stuff that we bought over the past month is being shipped to a local mailbox store. We want to pick that stuff up. I am going to visit with my friends Steve and Elizabeth today. I first met Steve and Elizabeth on June 1, 2004, when I traveled to their home-based business to get advice on increasing MsTioga's solar capacity. The name of the business is "Backwoods Solar" [Link]. 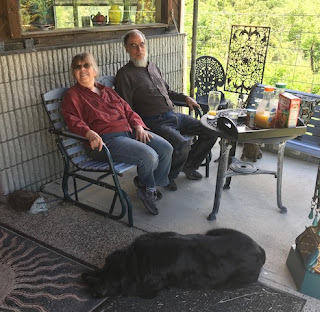 During our visit together today, neither Steve, Elizabeth or myself remembered when I first visited them and why I was at their home! I had to search my Blog's archives to answer those questions! Thru the years that followed, I kept in touch with Steve by emails from time to time. 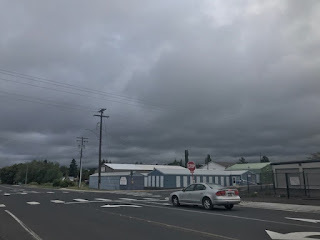 During our trip north from San Diego to see the Salmon River [May and June], I realized that I would be getting very close to Steve and Elizabeth's home. I phoned Steve that I would like to drop by for a visit. And that is what I'm doing today! 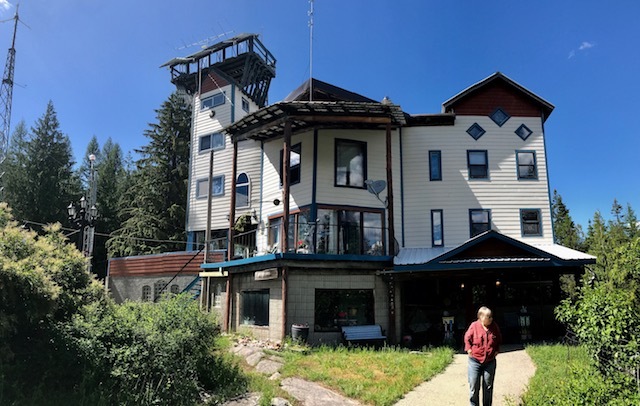 Their home is where they pioneered the use of solar power back around 1975. You may read about their story by clicking [Here]. If you click on the pic of the home above, it will expand so you may see the windmill-generator at the upper left corner. Their solar panels are on the roof of tallest part of their house. It is called "the tower." How Steve mounted those solar panels way up there I cannot imagine!! 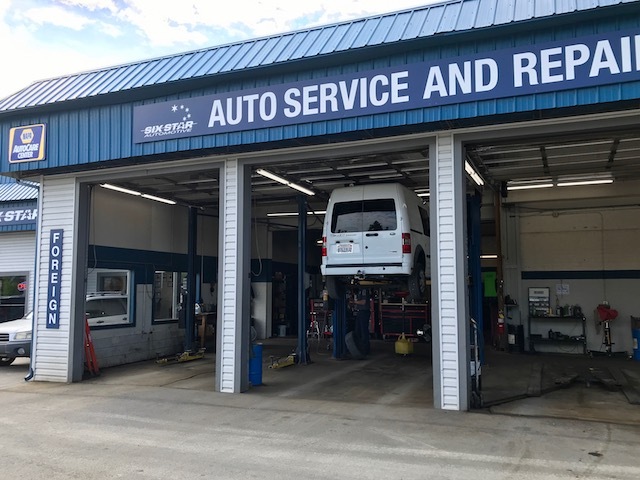 Reader Mister Ed has commented that I should get a second opinion for the repairs that the Rokstad Ford has informed me are required for my 2012 Ford Transit. I have chosen Emerald Automotive in Ponderay Idaho for that second opinion. Also, although I asked Ford service for an itemized copy of the work order, I've not received one. First thing this morning I'll ask again for that work order. We have just finished unhitching Scampy at the Rokstad Ford parking lot. Señor Tránsito has an appointment for service at 9:30am. The Scampy Team is going to hang around Coeur d'Alene this morning. The streets here are sloped for proper drainage gradient. It's not comfortable to be inside Scampy when she is angled a lot. An RV that is leveled on the street may bring attention by the local authority. We do not wish to attract that attention. For that reason, we do not usually level out. But it is a gorgeous day in Coeur d'Alene! The temperature will be in the 60s by midday. And now that Scampy is leveled out, we may mess around here in comfort. Isn't Scampy as cute as can be? We are in Moscow Idaho. The sky is filled with dark grey clouds. The temperature is 44℉, which means that Wave3, our catalytic heater is remaining on high during the day. 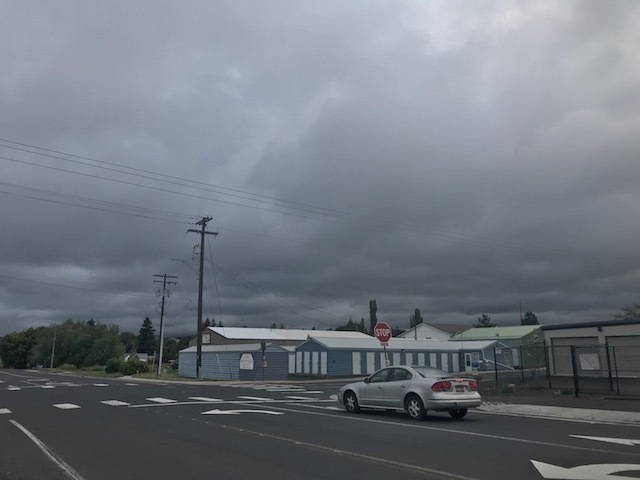 These dark clouds also affect our solar electric system. Right now we are able to charge the battery of both Mac and iPhone and have lights on too. About an hour ago, there was not enough Sun power to do that and our inverter's output shut down! Today is the 2nd day of my T-Mobile billing period. My phone shows that I used 1.62 GB data. How could I use that much data in only one day? However, if during the rest of this billing period I continue using this amount of data each day, I will not exceed my 51 GB data allotment. Today begins a new data cycle for my T-Mobile account. I now have 51gb of data that will stream at high speed. Because I did not fully comprehend what happens when my data usage goes over 51gb, I used data indiscriminately. From now on, I will be cautious with data usage because I aim to stay under 51gb for the entire cycle. Because our Camp is at the bottom of a steep canyon, the Sun has not yet made itself known this morning. We are able to see the sky and there are only a few clouds. There is no T-Mobile signal in the Town of Riggins. We cruised thru town searching for open WiFi, and none could be detected. 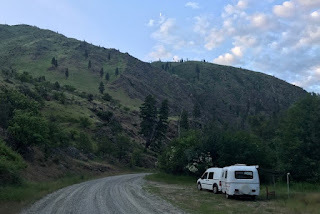 We decided to follow the road that runs east alongside the Lower Salmon River. Our plan is to find a campsite close to the river. 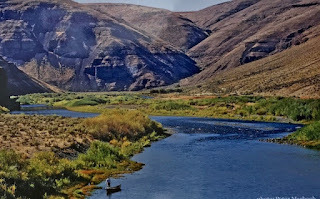 When we head out from New Meadows Idaho this morning we will be only 35 miles away from the Salmon River! The main thing that got the Scampy Team started on this adventure trip was reading our Blog post on May 16, 2004. On that date, MsTioga made her Nite Camp by backing in between two boulders overlooking the Salmon River. That Camp was the best! We could see the Salmon River thru MsTioga's rear window! The water of the river flowed only 20 feet below. Click [Here] to view our Blog post on May 16, 2004. Have you noticed how close we are getting to the Salmon River? 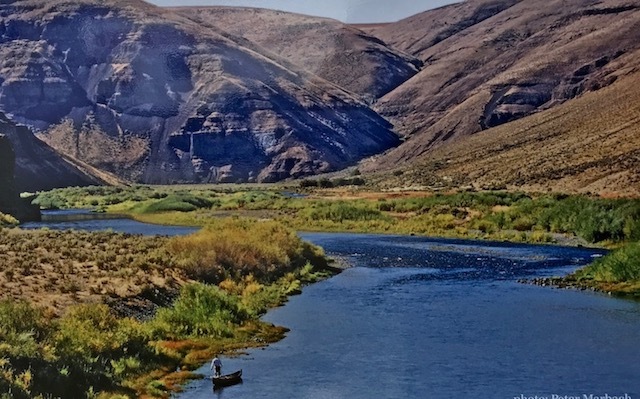 The Salmon River is only about 110 miles away! We have driven 1,000 miles since leaving San Diego on Friday, May 18th. Little by little, with only small day trips, look how far we have come! Baby Boid makes up games for himself. One game that he made up recently was to knock one of his swing's supports off. Then Boid climbs up on to the swing which is now hanging by only one support and messes around. Note: The sound in the background is the PBS Newshour. Last Nite when I went to bed, sleep would not come. So I took a second Trazodone 50mg. Then when I finally went to sleep, it was not a deep sleep. I was not breathing freely. So I took two allergy relief pills around 3am. That did the trick. I did not awaken until after 9am. 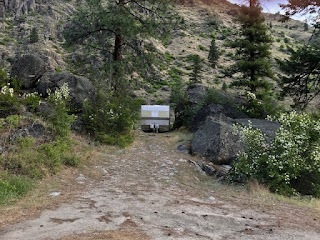 Before leaving Lakeview Oregon this morning, Scampy's propane tanks will be filled. 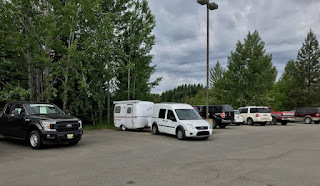 We spotted a propane place yesterday close to our Nite Camp. We need to buy some of those little laundry packs that contain concentrated detergent. Those packs really do a good job for me! We also need to buy tire black.